The Technology Collaboration Programme on Solar Heating and Cooling (SHC TCP) is one of the oldest in the IEA, established in 1977. For over 40 years the SHC TCP’s overarching objective has been co-operative research, development, demonstration and exchange of information regarding solar heating and cooling systems. This document describes the strategic direction and activities of the SHC TCP for the term from 2019 to 2024. Solar energy technologies and architectural designs that include active solar thermal heating and cooling, photovoltaic driven heating and cooling, passive solar building design and solar architecture, including the consideration of daylighting and thermal comfort. This definition includes hybrid technologies and companion heat storage and supply technologies and applications. Active and passive solar heating and cooling can be applied to provide light, hot water as well as heating and cooling in the residential and service sectors and heating, cooling and drying in industrial and agricultural processes. What do we mean by solar heating and cooling? 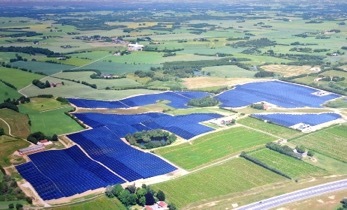 World’s largest solar district heating plant in operation in 2018 (110 MWth) in Silkeborg, Denmark.